General Manuel Antonio Noriega, former military leader of Panama, died aged 83, on Monday, May 29, 2017. Although my novel Iraqi Icicle Third Edition is set in Australia, my novel explores the exploits of Manny Noriega in Panama and the U.S. Here is an excerpt. THAT SAME DAY, of December 20 1989, 27,000 American troops invaded Panama in Operation Just Cause, to arrest that country’s President Manuel Noriega for drug and arms smuggling. British Prime Minister Margaret Thatcher applauded the American invasion, for upholding ‘the rule of democracy’. Only the cynics wondered if Mrs Thatcher was confusing ballistics with ballot boxes. What sparked my interest in an otherwise routine U.S. invasion of a country they could wup purdy easy, was the use of rock music as psychological warfare. I suspect I was not the only shallow hedonist who forsook the music reviews for the world news pages at this time. I had to take a peek when I heard that Uncle Sam was shaking his booty. I studied the form of the Noriega arrest with the Gooroo, who dubbed the invasion Operation Just Cause We Can. A lot of speculation about American motives for the stunt sprang up, as always happens with these adventures. The cynical money was on the treaty that said that the politically and financially strategic Panama Canal had to be handed over to a Panamanian girl or boy to play with by January 1, 1990. The landlord of the canal could charge a ship more than $100,000 for passage and the Americans had built most of it. Most of the world never found out what was correct weight on the deal, as the Washington nobs reading from the full script were not giving the plot away. 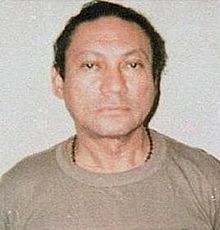 The stated reason for arresting Noriega – for drug trafficking – seemed a little thin, as the Americans had refused to take the naughty president from rebel members of the Panamanian Defence Forces when they had captured him in October. The Gooroo speculated that the planning of the invasion must have been well under way by then. The joint chiefs of staff were not going to have their big Christmas party upstaged by a few disgruntled nobodies in the Panamanian military. As for Manny’s cocaine smuggling, human rights abuses and election rigging? His form suggested it was no better nor worse than when he was a friend of the US, purportedly on their payroll to the tune of a hundred grand a year to spy on the bad guys in the area, such as the Reds in Cuba, Nicaragua and El Salvador. As I say, my interest in such matters grew from international media stories about the hip ploy of rocking with the war machine. Armed Forces Radio playing rock music was nothing new – the practice was top of the charts in the Vietnam War. The aim then, though, was to raise the morale of the good guys, not to lower the spirits of the bad guys, or in this case The Bad Guy, Manny Noriega. It seems that U.S. troops on the ground in Panama shared our infatuation with the reports of rock weaponry. When the good news reported in the U.S. media rebounded to Central America, the soldiers on duty inundated military DJs with musical requests, thus reinforcing a budding myth. International journos decided that rock music warfare was a better Sunday read than stories of thousands of Central American civilians being killed. They knew their readership tastes better than their history. Before the world press found Manny in the Vatican Embassy, they dutifully repeated military PR speculation that Noriega had probably fled to the Cuban or Nicaraguan embassies. But Manuel, for fun and profit, had been spying on those two socialist countries for the Americans. Still, it made good sense to all the suburban hawks, stretched across their couches in the lands of the free, that the Cuban or Nicaraguan lefties had given shelter to the Antichrist. To make sure Noriega was demonised by all political persuasions, the military PR machine planted a photograph of Adolf Hitler in the President’s unoccupied abode. As it turned out, Manuel had taken refuge in the Vatican Embassy in Panama. The story of U.S. military blasting the embassy with rock music was embellished for the entertainment of all us citizens of the global village. As far as eyewitnesses could piece it together, the GIs had started to send in requests to their radio station for songs that they felt had anti-Noriega titles or lyrics. These requests were being played, but the music was not physically directed at Noriega until late in the piece. One group of soldiers decided to direct their loudspeakers at the Vatican Embassy, perhaps as late as Boxing Day and certainly after the rock-music war was exaggerated in the world’s newspapers. Once the quirky newspaper reports rebounded about the tactic of using rock music as a weapon, other groups of troops followed the leader and directed their speakers towards the hallowed ground. It seems the Vatican complained to U.S. President George Bush about the racket, if not the tactic, and the practice stopped before Noriega surrendered on January 3. That part of the story rarely filtered out, and we were savouring the image of the Antichrist leaving the protection of the Vatican embassy and falling to his knees in tears. ‘No more top forty, no more Twisted Sister’s We’re Not Gonna Take It,’ we pictured Noriega begging of the troops besieging the Holy Ground. Compared to the myth, the truth of the rock weaponry never lived up to its potential for drama and humour. Luckily for the spiritual nourishment of us global villagers, our educators in the international media printed the legend and not the truth. The juicy image of the Devil’s music being strategically trained on an Embassy of the Holy City to smoke out the drug-peddling Antichrist became the reality. The Gooroo had more contacts in Australia and overseas than the entire Australian secret service, so he was able to feed my obsession with the Panamanian proceedings with as much of the real news as possibly anyone here was receiving. A lot of the requests to blast out Noriega were for rock classics by the Beatles, the Stones and the Hendrix Experience. Of course, Steppenwolf’s The Pusher was a fave. Some historical selections bordered on the satirical. Outstandingly humorous examples included Paul Simon’s 50 Ways to Leave Your Lover, Springsteen’s anti-authoritarian Born to Run and Funkadelic’s weird Electric Spanking of War Babies. Metal and hard rock dominated the requests for contemporary 1989 material. Metalheads White Lion earned their stripes with Little Fighter, while Danger Danger got Naughty Naughty on the playlist. As you might expect from the band’s title, Guns ‘n’ Roses were in demand with Patience and Paradise City going for a few spins. Much of the American material really spoke to and about the invaders more than the besieged Noriega. Paradise City was particularly unflattering, with its declaration that someone had done in Captain America. If the ideals of the invaders had lost their way, the youthful soldiers imposing those ideals often had no way to lose. At least, that was the message Skid Row was screaming at Noriega through their 1989 hit Youth Gone Wild, a tough, anti-authoritarian anthem. Some of the contemporary hits seemed to have a perverse undercurrent of sympathy for The Bad Guy, as with Megadeth’s resurrection of the Alice Cooper hit No More Mr Nice Guy. On Christmas Day, the DJs declared a break from playing the anti-Noriega requests, and they only spun Chrissy tunes. Hey, they might have played Bruce Springsteen’s version of Santa Claus is Coming to Town, released on a single in 1985. New York hip hoppers Run–D.M.C. might have got a run with their infectious 1987 ditty Christmas in Hollis, the neighbourhood where the trio of rappers grew up. In that year of 1989, the Bob Geldof and Midge Ure 1984 charity tune Do They Know it’s Christmas was re-recorded. Both recordings raised money for relief of African famine. Maybe it was played when Santa Just Clause came to Panama. The DJs probably gave Prince’s 1984 epic ballad Another Lonely Christmas a miss as it recalled the death of a lover on Christmas Day. They probably didn’t play my Dad’s 1971 release Happy Xmas (War is Over) either.